Poets Baron Wormser and Jeanne Marie Beaumont are offering a weekend long course entitled "Plath and Shakespeare" at The Writing House, 13 Loomis Street, Montpelier, VT. The course will be held 16-17 April 2016, 9 a.m. to 3 p.m.
Limited to six participants: first come, first served. As of this blog post, only two spots remain open. 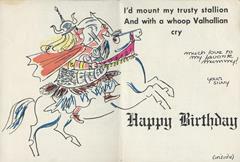 Sylvia Plath was deeply attuned to the poetry of Shakespeare. His work offered her an emotional scope, a trove of verse techniques, a bottomless vocabulary, a stunning range of tones (both comic and tragic), the felt presence of classical themes, and an insistence on the primacy of drama. 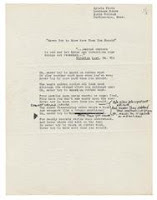 Accordingly, we will be looking at some Plath poems through the Shakespearean lens to see how she seized upon his plays as an aid to creating poems that were brief yet powerful dramas. Any poet with ambition yearns to reach the phenomenal eloquence Shakespeare represents. Plath not only had that ambition, she worked deliberately and intuitively at making that eloquence her own. When Sylvia Plath died she left plans in suspension. On 11 February, she was supposed to meet her new editor at Heinemann David Machin for lunch. He sent a letter on 12 February asking "Did something go wrong about our lunch date yesterday…" It is one of the most haunting and chilling documents I have ever worked with and is held by the Mortimer Rare Book Room at Smith College. 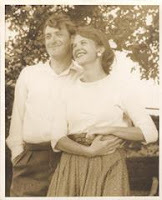 The rest of this post looks at some of the events which we know Plath had planned and commitments in the works and how some of them turned out. 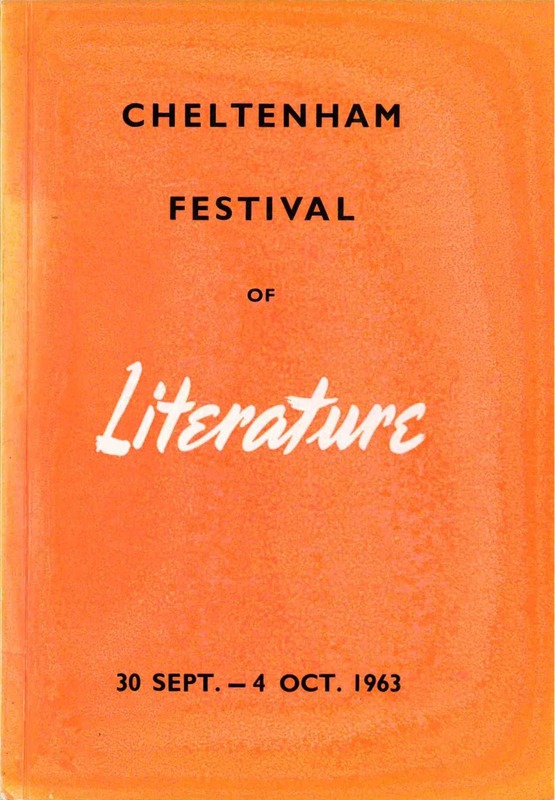 On 12 February 1963, an article ran in the Financial Times titled "Cheltenham Festival of Literature". 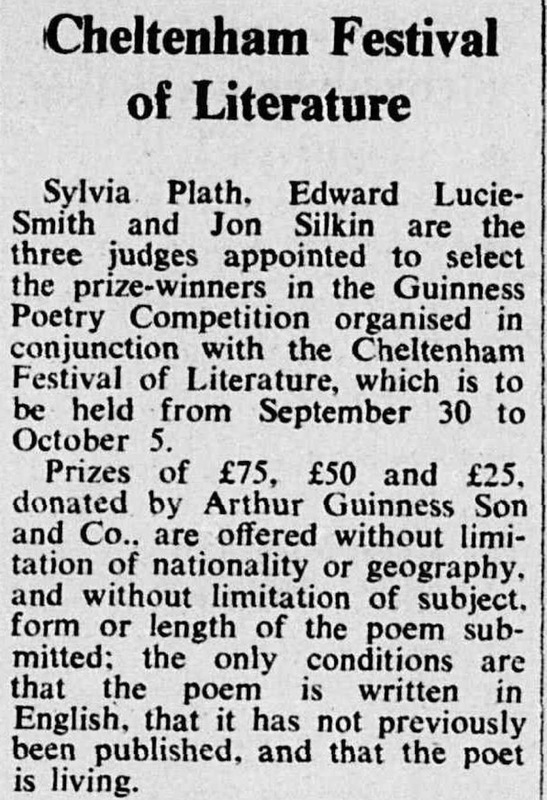 In the short article, which appears to the left, it was announced that "Sylvia Plath, Edward Lucie-Smith, and Jon Silkin are the three judges appointed to select the prize-winners of the Guinness Poetry Competition organised and in conjunction with the Cheltenham Festival of Literature…" (22). The article was reprinted in the Irish Times on 13 February 1963. Plath herself had won the Guinness Poetry Award in 1961 for her poem "Insomniac" and she served as a judge in 1962 (awarding the prize to Richard Murphy for his poem "The Cleggan Disaster", which kind of sums of Plath's own experience in Cleggan in September 1962). In 1963, the winner of the Guinness Poetry Award at the Cheltenham Festival of Literature was none other than Assia Wevill's gossip-confidante Nathaniel Tarn for his poems "The Cure" and "Fountains Abbey Under Snow". No judge replaced Plath. Second prize went to Irene Dayton for her poem "Faust's Devil Walks Into Time Beyond" and third prize was awarded to Terence Tiller for "What The Giant Thought". Silken and Lucie-Smith also saw that Patricia Beer's "Epitaph in a Country Church Yard" and Ken Smith's "Means" earned some money and recognition from Messrs. Arthur Guinness. There was sadly no mention of Plath in the the Festival program printed that year. In her 4 February 1963 letter to her mother printed in Letters Home, Plath wrote about several things to which she was looking forward: her college friend Marcia Brown Plumer (later Stern) visiting England in late March. Also, she had the "chance for three weeks in May to be on the BBC Critics program . . . Each critic sees the same play, art show, book, radio broadcast each week and discusses it" (498). Plath met with Philip French, producer in the Talks Department of the BBC, on Friday 25 January 1963 and had a letter from him on 1 February 1963 offering the contract to appear as the broadcasting critic. Plath signed the contract and returned it. 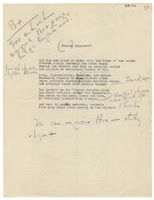 According to documents in the BBC Written Archives Centre read by the inimitable Gail Crowther, Plath's appearances were to be recorded on 2, 9, and 16 May and broadcast on 5, 12, and 19 May. There is no possible way to know that what was eventually broadcast would have been the same content had Plath appeared on the programs. However, it might in interesting to see the eventual participants in the program and what actually was discussed. 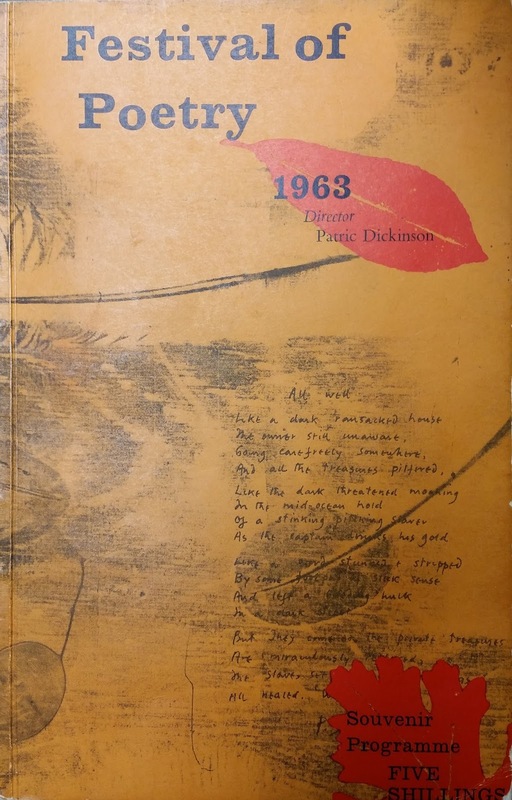 From October to December 1962, Plath was abuzz at the prospect of being asked by the Poetry Book Society in association with the Arts Council to produce an "American Poetry Night" at the Royal Court Theatre in the summer of 1963. The Festival of Poetry took place from 15-20 July 1963. Plath & Hughes participated in the 1961 Festival of Poetry at the Mermaid Theatre organized by John Wain in July 1961. The 1963 event was at the different venue and was organized by Patric Dickinson. According to the program for the event, a copy of which was kindly given to me in 2013 by Rosemary Clark when Gail Crowther and I gave a reading at Plymouth University, the American Poetry Night was held on 16 July 1963 and was presented by Eric Mottram, with assistance from John Hollander and Jonathan Williams. 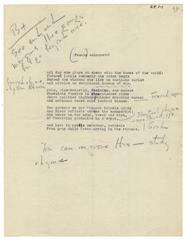 In addition to Hollander and Williams, the poets involved, as listed either in the program or in contemporary newspaper articles about the event, were Robert Lowell, Muriel Rukeyser, and Ronald Johnson; Guy Kingsley Poynter read from Paterson by William Carlos Williams. I do wonder which poets Plath would have invited? The evening was reviewed in the article "An Experiment with Poetry", The Times, 17 July 1963: 13. Ted Hughes participated and read during the Festival; it is unknown if any memorial words for Plath were said. All links accessed 10 January 2016. Bonhams Knightsbridge is holding a Fine Books, Atlases and Manuscripts auction on 16 March 2016. There are six lots of Sylvia Plath items, Lots 140-145. These are part of that big 2 December 2014 auction that Sotheby's failed to sell. Back in November 2015 Bonhams held a very successful sale of a couple of lots from this private collection (results). 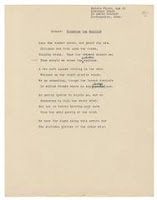 The other poems are: "On Looking into the Eyes of a Demon Lover", "Morning in the Hospital Solarium", "Prologue to Spring", "Trio of Love Songs" ["Parallax"], and "The Trial of Man"
All links accessed 9 February 2016. I was surprised recently to discover that I have been looking for the press releases that Sylvia Plath wrote for Smith College's Press Board for more than six years. This was determined judging from the file creation dates for some PDF's that I have. Granted, this project was done off and on as time and as information from my various researches permitted, but it is a long time and I think this post will represent closure on the project (for now). In March 2015 I spent four days at the Lilly Library. Held there are a couple of spiral bound notebooks that Plath used for recording impressions and quotes and interview notes that she then used to write her releases. This was really valuable information because it also complemented her wall calendars where she noted down class assignments, dates, extracurricular activities, vacations, films and plays, and other details of her life at Smith College. The calendars for 1951, 1952 and 1953 contain a wealth of information about Plath's first years at Smith. 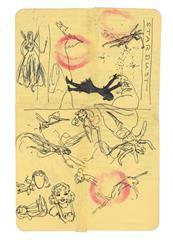 Plath often would write "cover due" or something like this to indicate when a story was due. Using these calendars as well as her notes, letters, and also information from the Smith College archives about the campus events at Smith, I was able to attack this side project with a vengeance in the fall of 2015. The results were largely favorable. excerpt from "Says Music Can Illustrate Cultural Life of a Nation". excerpt from "Misery of Man is Due to His Defects". "'Smith Mobile' Scheduled for October 15, 16." Daily Hampshire Gazette. October 10, 1952: 8. "Religion After College Will Be Discussed at Smith." Daily Hampshire Gazette. November 15, 1952: 7. "Sylvia Plath was busy...did you know" (8 March 2012); "New Article Written by Sylvia Plath Found" (20 May 2014); "Sylvia Plath: Covering the Crisis" (8 June 2014); and "More Sylvia Plath College Articles Found" (7 July 2014). Plath spent upwards of 12 hours a week on Press Board activities. So there is a likelihood that she authored more than what this research has found. 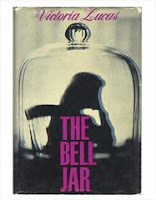 You can see a complete list of Plath periodical publications on my website, A celebration, this is. PDF's and JPG's of all these articles will be given to the Mortimer Rare Book Room at Smith College later this month. All links accessed 6 November 2014 and 17 October 2015.